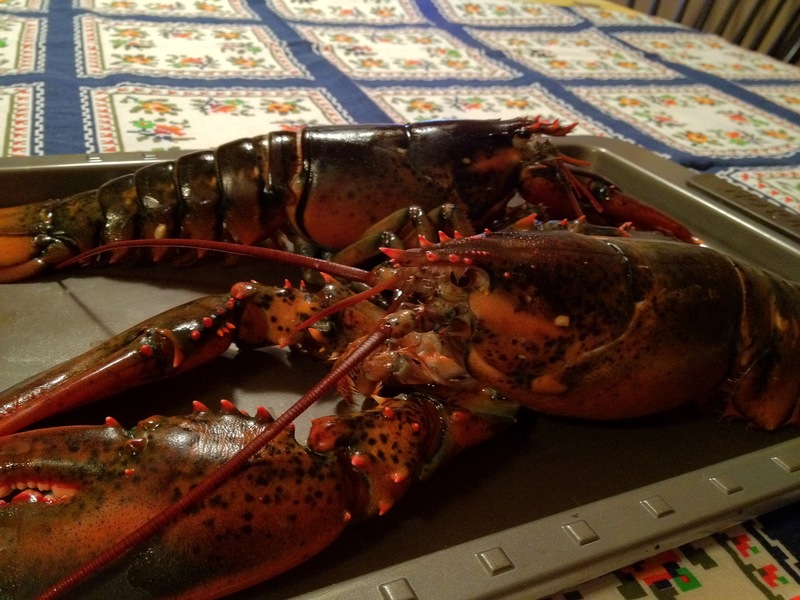 Holiday Re-Cap: Memories of Lobsters Past, A Feast Short of Four Fishes, and… fried balls? I am writing from my mother’s kitchen table, still full from our afternoon meal. I was here two days ago, on the 24th, for our yearly Christmas Eve feast. The Italians are famous for the Feast of the Seven Fishes on Christmas Eve; since it’s just Mom and me, we scale back a bit. Usually our meal begins with fried squid (calamari) or shrimp, followed by a pasta-with-fish course (usually clams or mussels), and for the main course, lobster. Always lobster. When I was little and my parents were still married, we had a much bigger crowd for Christmas Eve dinner, about ten people. My father and I had taken to racing the lobsters on our kitchen floor before they met their death in my mother’s able hands at the sink. They didn’t move very fast, but watching eight lobsters waddle about was great entertainment for us, until we were shoo’ed out of the kitchen and back into the living room, where I was stuck watching football and staring longingly at unopened presents. As the years passed, the crowd at the table got smaller and smaller, and I stayed in the kitchen watching TV while my mother cooked. Some years she prepared a stuffed lobster, and bought another to make a wonderful red sauce to have over pasta. 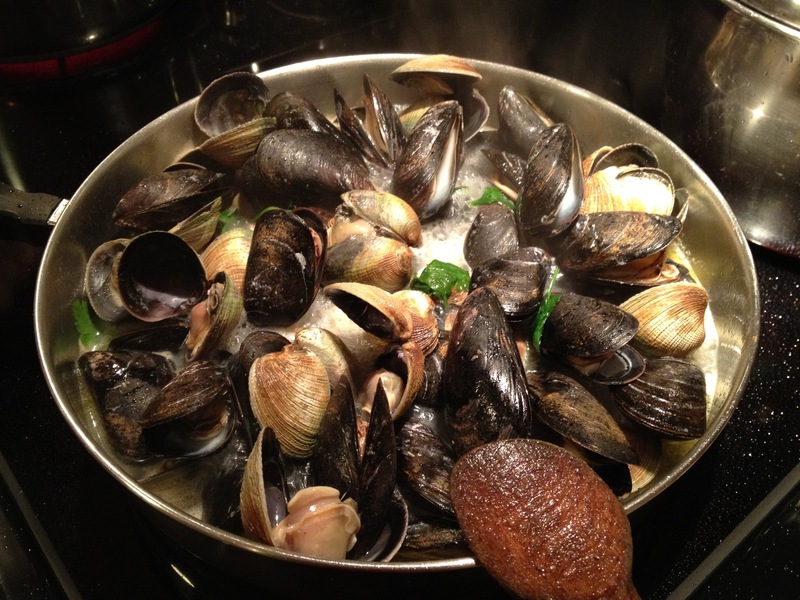 Other years, she made linguine with clams, and steamed that second lobster so we could dip the claw and tail meat in a garlic-parsley butter. Last year, my mother didn’t have time to go shopping till the morning of the 24th, when the supermarkets are teeming with nervous cooks speeding down each aisle, stopping only at the meat counter or fish counter to pick up the centerpiece of their dinners, usually ordered well in advance. My mother had not placed an order for lobsters (generally we each get one, around a pound and a half each). When she got to the fish counter, there was a lone lobster left in the tank. This lobster was unlike any my mother had ever brought home, and much larger than anything she’d even consider preparing for two people. Sure, we could have eaten something else, but this was for Christmas Eve dinner, and she didn’t want to disappoint me. Are you sure you want to remove those rubber bands? This guy weighed in at about 5.5 pounds, and I bet at least a third of that was in its left claw. The tail alone contained over a pound of meat. Killing the creature was a two person job—this guy was a wriggler, and a strong one at that, so I held him still, and my mother delivered the fatal stab to his middle, killing him instantly. In the end, my mother prepared three courses from this one lobster, and we still had shrimp, clams, and calamari to eat, too. It was an incredibly delicious but overwhelming meal. This year, my mother did her food shopping on December 23rd, and nearly had to beg the fishmonger for two small lobsters (he had a full tank, but many orders to fill). 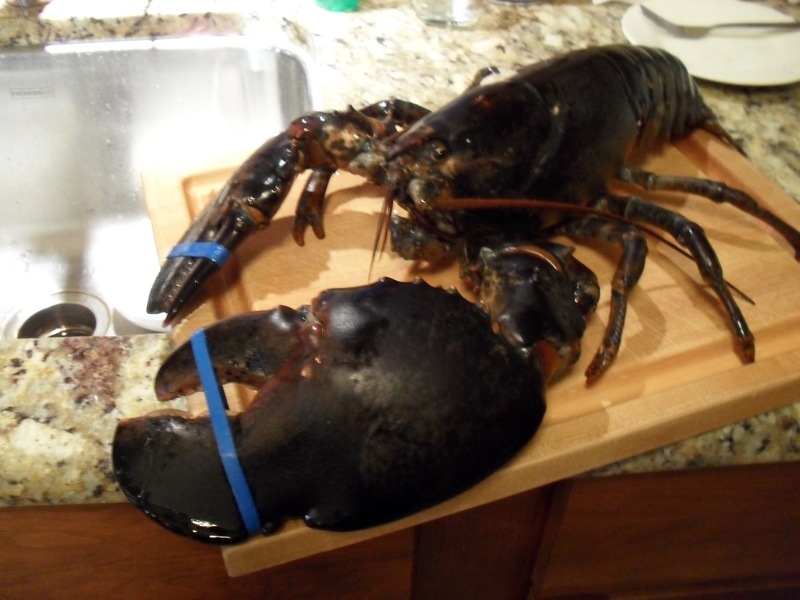 My mother prepared her lobster in red sauce, and steamed my guy. We skipped having an appetizer in favor of having more pasta. ...with spaghettini. "Tutti a tavola, a mangiare!" 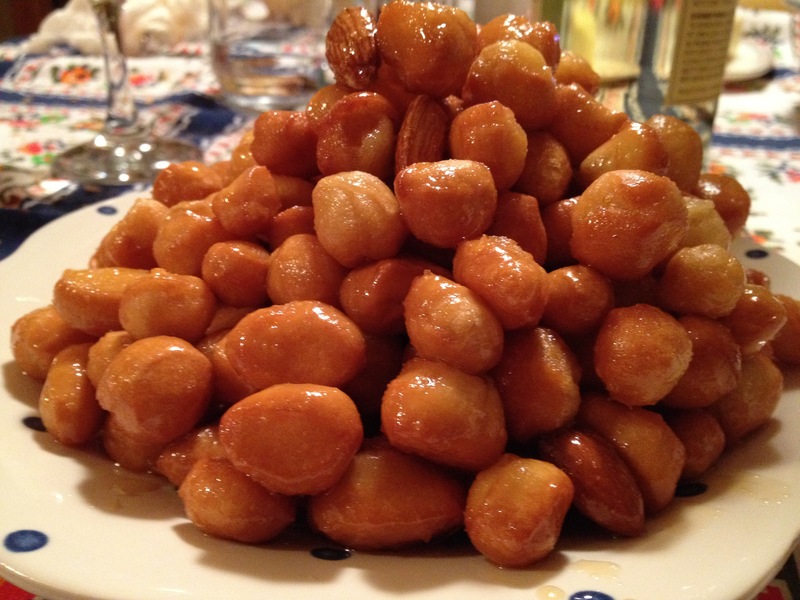 It was a wonderful dinner, made even better by our dessert—a very traditional Italian holiday favorite: pignolata. The preparation for pignolata (also known as Struffoli, if your mom or grandma is from Naples) is about as simple as it gets. You prepare a pastry dough, generally not more more than flour, eggs, a bit of butter and a pinch of salt. The dough has to rest about a half hour at least until it is rolled out, cut and shaped into ropes, about a foot long and a half-inch wide. Each rope is then cut into segments, about 3/4 of an inch each, before frying. Drain the fried dough of any excess oil on paper towels. At this point, you’re basically looking at fried balls. But pignolata is more than fried balls! And pignolata sounds so much nicer! While the balls, err—bits of fried goodness—are cooling, prepare the sauce: put 3 parts honey and 1 part sugar in a large sauce pan or stock pot and bring to a boil. Next, add the grated zest of one lemon and reduce heat to very low (unless you’re working on an electric stove—the shut the heat off entirely). Then add the fried bits, with a handful of roasted almonds, stirring to coat everything (which takes a few minutes). Pour out of the pot and into a platter, shaping however you like. You can top the dish with sprinkles, but there’s really no need. It already tastes like Christmas. Some girls want clothes, others want jewelry. I wanted cookware. I would especially like to thank both my mom and dad for supplying me with a fleet of brand new cast iron pans, a Dutch oven, a variety of awesome bakeware, cookbooks and kitchen tools. 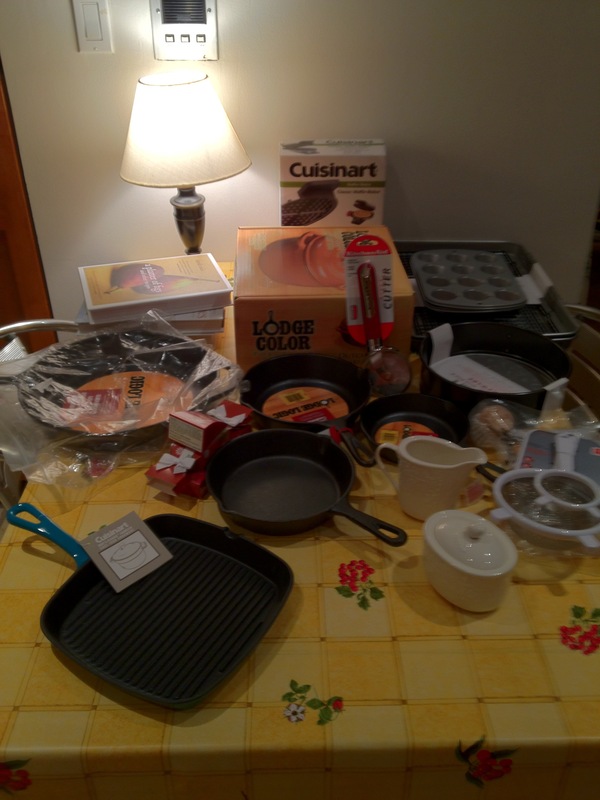 It’s going to be a great year for cooking! 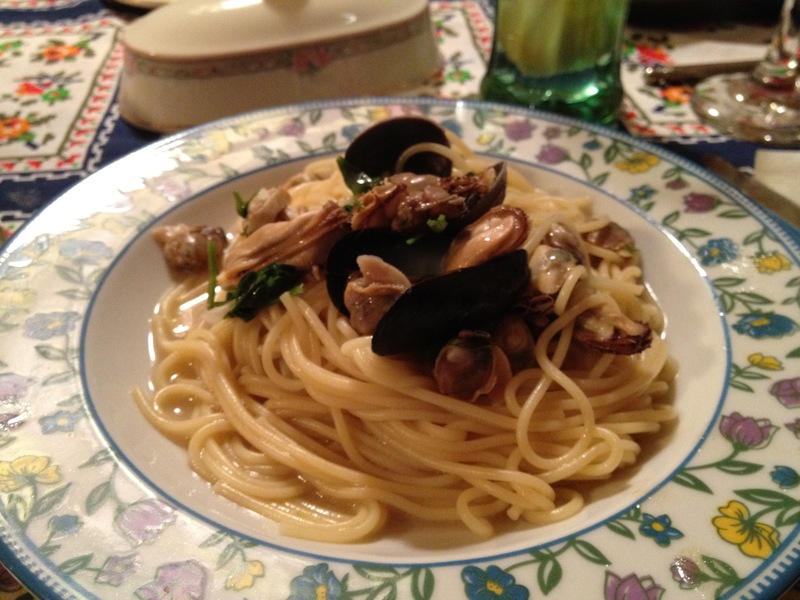 This entry was posted in Musings, Savory, Sweet Tooth and tagged christmas eve, clams, cockels, desserts, holiday, italian, italy, lobster, mains, mussels, pasta, pignolata, struffoli, traditions. Bookmark the permalink. ← Food Reading: It’s Dining & Wine Day!